For the rest of the time at the Finca we continued with ceremonies every night except the last one. The idea being that the final day would start early, about 6am, and be quite full before nightfall. The following morning, a Monday, we were to board, first the taxis, and then 2 separate buses that would take us to Gualaquiza, in Morona Santiago province. Paul wanted our energy levels high for these leapfrog transportation undertakings, and it was just as well. Non-stop ceremonies had a cumulative effect for by the end of a week none of us found much time for sleep. Once the goodbyes concluded, we worked our way back through Catemayo where about ½ of the group split off to return to Quito for flights back home. The rest of us, about a dozen or so, purchased tickets for Loja where we would locate a bus to Morona Santiago. The weather, as it had been during the retreat was in the mid to high 70’s and no rain, so moving our mountain of luggage, though much smaller, was also easier in these pleasant conditions. And we were all grateful since the scenery, which was certainly beautiful outside of Catemayo continued its dramatic unfolding with grander, broader vistas of misted mountains and rivers that kept increasing in size. While we were dropping in elevation the mountains within view remained quite high as we followed Andean drainage basins and at some point crossed a continental divide. Now, instead of flowing to the Pacific, these rivers were all destined for the Atlantic via the Amazon. We passed through Loja province and into the southernmost Ecuadorian province of Zamora Chinchipe, and when we reached the provincial capital of Zamora, we headed north into Morona Santiago. It was a full 8 hours of bus rides that finally dropped us off on the highway to lug our bags (they’re not called luggage for nothing) 20 minutes up a hill to Miguel and Gabriela Archangel’s compound. By then it was late afternoon and time for some quick introductions and another simple but tasty meatless meal. 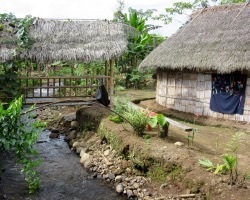 Shaman Miguel had built his own Lodge, one that Paul had lent him several thousand dollars to build. But with this being wet Amazonia, the dirt floor was far more plastic and sticky than that at the finca. And for the 5 days or so that we were there, along with some days of rain, we relied even more so on those Wellington boots. The ceremonies, which began that night, were of a different type and style. Each night we were expected to sit upright on hard benches in almost total darkness, while Miguel and Paul sang, chanted, and played their instruments. And mid-way through these ceremonies we had a surprise when Landry, a tall young Frenchman in our group, began playing the drum and beautifully chanting North American Oglala Sioux songs. He was really good! He later explained that he had studied (and studied quite well) with a Sioux elder who took up residence on the small island off central France where Landry lives. By this time Gabriella was also regularly attending the ceremonies. We had been told earlier by Paul that she herself is really a shaman, but she denies all talk of this sort. However her touch gave her away and we all knew from that personal physical contact that she has powers that probably surpass her husband Miguel. After the first night’s ceremony, which was a far stronger brew that brought on difficult struggles for the whole group, Gabriela started passing by each of us and placing her hand on the top of our heads as we were seated on the benches and feeling the first hallucinatory effects of the brew. By sharing her touch, she was able to convey an amazing feeling of peace and tranquility. She also came outside and stood with us while we vomited, since a number of us, myself included, lost muscular control and the ability to make it back into the Lodge on 2 feet. I had neither visions nor hallucinations during the stay here with Gabriela and Miguel. I discovered later that the reason was due to lack of technique. In preparing for a ceremony, a participant needs to prepare with a heavy dose of introspection. And the product of that introspection needs to take the form of a petition to La Medicina. The vine should be addressed with a question or an enunciated goal that is both quite clear and very specific. I knew none of this at the time and as a result I came away with little more than a clean digestive tract. I was also still having sessions that were diverted away from the spirit world by heavy body-energy discharges. Diarrhea, just so you know, is also a common method of purging, though usually not as frequently a purge as vomiting, therefore a number of us came away very clean after our stay. So when the time came to leave I believe that all of us looked forward to a change. And thankfully Paul had saved the best for last. Heading further north to Macas, the provincial capital of Morona Santiago, we started hearing about Alberto Catan’s place. 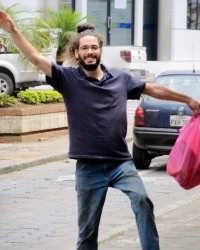 Alberto, if you remember, led our first ceremony at the Finca, and his wide open smile and good nature from that time nurtured our anticipation of staying with his family outside of Macas. Paul had also prepared us with the knowledge that we would take part in the yearly celebration of the Chonta palm and the harvest of its fruit. In a phrase, Alberto’s compound was a Garden of Eden. He had a fast-flowing stream running through the center of the property and a separate sleeping lodge for guests, which we gladly inhabited during the week we were there. Alberto, his wife María, and their extended family welcomed us all and we could tell that this part of the journey would be fine. And it was. There was a separate Shaman Lodge, a separate dining house (that straddled the stream), beautifully planted grounds, and an overall peacefulness that we immediately absorbed. 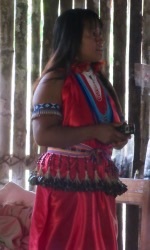 As with our first Shuar family, we also began our ceremonies here on the first night. There was some concern among us that, like the first ceremony at the finca, this first ceremony at Alberto’s place would also be a spiritual assault. Alberto cooks a mean brew and sees no reason to dilute his creation. That first session at the finca gave everyone strong hallucinations, so we prepared as best we could. And strong they were, though again, because of my ignorance, most of my time fell to purging and calming my body reactions. As with Miguel and Gabriela, these sessions were endured on hard benches, though his fire was more substantial, and this helped us keep from stumbling. More light also feeds hallucinations with the increased visual input, and later many reported just that effect. Me? I was standing on the bank (when I wasn’t bent over) and watching the river flow. But on the night of Natemamu I got my second vision and loved every bit of it. Natemamu is a ceremony quite different than the “standard” natem/ayahuasca ceremony. During a natem ceremony the brew consists of the pounded inner bark of the natem vine and at least one other plant, usually just the leaves of the yagé, though often a leaf or two of toé. At the finca, about midway through the retreat, we had 2 successive nights of Natemamu and somehow each of us found the will to consume this unkind beverage. The afternoon before the first night Paul was explaining the protocol and what was expected of us. Even those of us who had participated in Natemamu before were apprehensive. I, of course, hadn’t experienced this sort of thing, but from listening to the others who had, I thought that I’d rather clean the toilets or something. As Paul explained it, “It all sounds pretty horrible, but actually, it’s much worse!” He wasn’t exaggerating. You think that you can’t possibly down anymore of this stuff, but there’s shouting all around you, you’ve already returned a good bit of it to the soil at your feet, but you remember why you’re here, and you drink some more. He had already counseled us to be ready for a heightened sensory awareness, and that we would be able to hear the earth’s rhythm. Again! The guy really knew what he was talking about. I could sense this noise pattern at the finca, and now here again at Alberto’s compound. There were new sounds (no, not just the puking) all around me and even though the sun had set some time before, it was light enough to see. A heavy, droning, thumping tone kept injecting itself into my awareness, and I guess that this was the earth’s rhythm Paul mentioned. 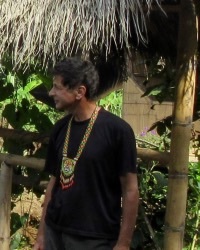 And then at some point Alberto somehow knew that we were done, and it was time to return inside the Shaman’s Lodge. We were all pretty weak by this time, and I somehow found the strength to climb up to the 2nd tier of the racks inside the Lodge, and I sprawled on my back in utter exhaustion. Sometime later, and I had no way of telling if it was minutes or hours, I received my next message. Again, the delivery was a mystery, but this time I did have a strong visual that drove home the message. By this time I had already been in Ecuador four months and most of that time I was quite comfortably ensconced in the house of my school director’s parents. Sofía’s parents are my age and we have become very close, laughing, joking, commiserating with each other as age takes its toll. And I could very easily stay at their place until Immigration pounds on the front door. But I wasn’t sure that that’s really the right way for me to be traveling. Well this message put all these questions to rest. You have no doubt seen those gag greeting cards that have a pop-up that jumps into place when you open the card, right? Well I essentially received the same setup in this second message. I was seeing the landscape of Ecuador as a giant carpet unrolling, with trees, rivers, mountains and all popping up as the carpet unrolled. And at the same time I was receiving the message that my Quito phase was over and until October, when my visa runs out, it’s my mission to hit the road. So after this plane touches down in Lima, I finish my work there, and return to Ecuador, I’ll be on the road, circling the country. I’ll start in Otavalo, an indigenous pueblo north of Quito and witness Inti-Raymi, the Andean indigenous New Year. Since December 31, I will then have witnessed 4 separate New Years in less than 6 months: the calendar New Year (which I celebrated by going to bed before 11pm), the New Year in el campo at the time of Guaranda’s Carnaval, the Shuar Chonta Harvest, and finally Inti-Raymi. It will be a lot of fun. 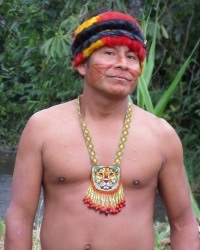 This entry was posted in Amazonia, ayahuasca, Natem, Plant Medicine, Shuar and tagged ayahuasca, Gualaquiza, Guaranda, indigenous, Kitchwa, Macas, Morona Santiago, Natem, Shuar, spirit world on 2015-06-03 by kmalivuk.